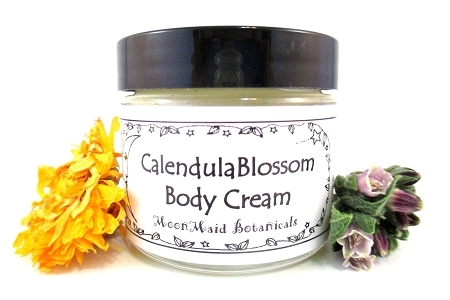 CalendulaFlower Cream - 2 oz. Calendula flowers and comfrey leaf infused in organic olive oil create a rich cream that is great for elbows and knees and other "trouble" patches or "angry skin." Lightly scented with a special blend of essential oils and flower essences this is a great after bath cream. I use it on my feet nightly. Packaged in a two-ounce glass jar. Lasts a long time!!! This cream is truly great for those dry areas like elbow, knees, thumbs. We keep it in the kitchen so it is handy. My husband's skin is particularly dry and Calendula cream works great for him too! Wish it came in a larger container. Love it, Cynthia. Thank you! I've been using this cream on my face at night. I love its smooth consistency and richness. It makes me feel like I'm nourishing my skin with TLC. Thank you! !